Left to Right: (front row): Jannero Pargo, Ronnie Brewer, C.J. Watson, Derrick Rose, Keith Bogans, John Lucas III, Kyle Korver. 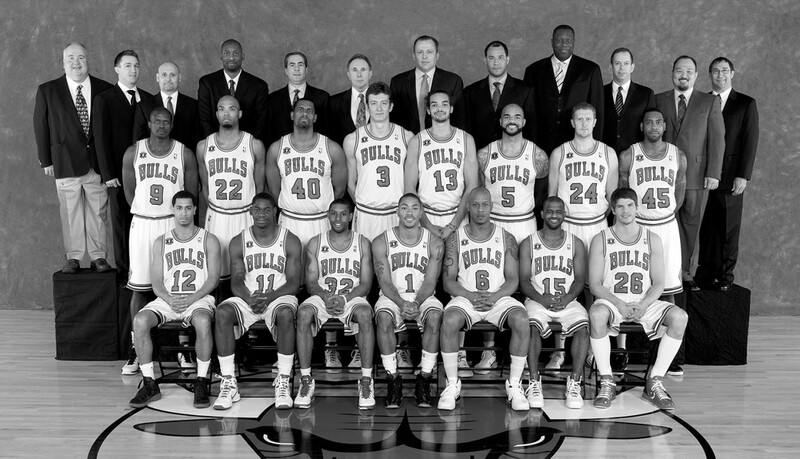 (middle row): Luol Deng, Taj Gibson, Kurt Thomas, Omer Asik, Joakim Noah, Carlos Boozer, Brian Scalabrine, Rasual Butler. (back row): Equipment Manager John Ligmanowski, Assistant Strength and Conditioning Coach Joshua Bonhotal, Strength and Conditioning Coach Erik Helland, Assistant Coach Adrian Griffin, Assistant Coach Andy Greer, Assistant Coach Ron Adams, Head Coach Tom Thibodeau, Assistant Coach Rick Brunson, Assistant Coach Ed Pinkney, Video Coordinator Jim Sann, Assistant Athletic Trainer Jeff Tanaka, Head Athletic Trainer Fred Tedeschi. Finished the regular season with a nine-game win streak, and an NBA-best record of 62-20 (Chicago’s best record since 1997-98) ... Chicago’s 62 wins were a 21-game improvement from the team’s 41-41 record in 2010-11 (the third-best single-season turnaround in team history) ... Tom Thibodeau’s 62 wins in his first season as an NBA head coach tied Paul Westphal’s league mark for the most wins by a first-year head coach ... Derrick Rose scored 2,026 points (25.0 ppg) to become the third Bull in franchise history (Michael Jordan 11 times, Bob Love twice) to score 2,000 or more points in a single season ... Rose also posted 623 assists and 330 rebounds to become the fifth player in NBA history to record 2,000 points, 600 assists and 300 rebounds in a single season ... the Bulls post- ed an NBA-best home mark of 36-5, and went 26-15 on the road, for their first winning road record since 1997-98 ... Chicago went 8-0 during the month of April for its first undefeated month since January 1996, when the Bulls went 14-0 ... Chicago ranked first in opponent field goal percentage (.430) and second in opponent points per game (91.3) ... Chicago sold out every home game on the year, and for the second straight season, the Bulls led the NBA in home attendance (21,791 fans per game) ... assigned the contract of James Johnson to the Toronto Raptors in exchange for Miami’s 2011 first-round draft pick which was held by Toronto (02/22/11). First round, Kevin Seraphin (France). 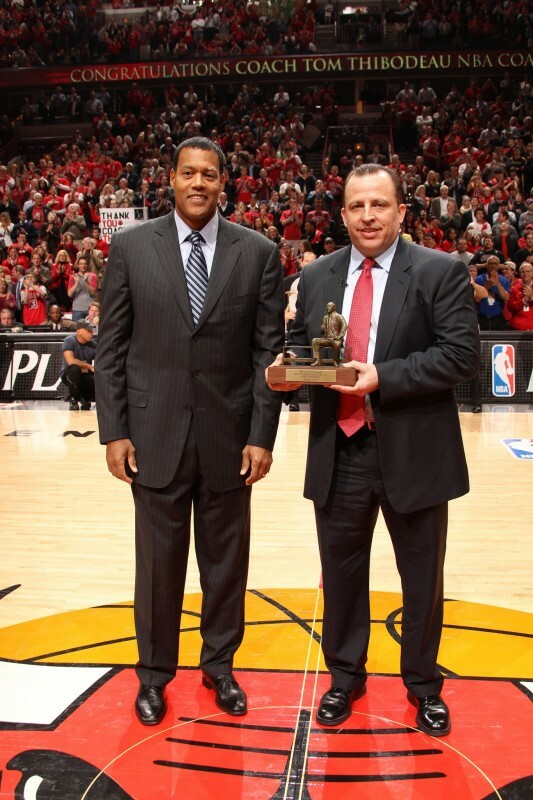 Traded Kirk Hinrich, the draft rights to Seraphin and cash consid- erations to Washington, in exchange for the draft rights to Vladimir Veremeenko (Belarus). Qualified for the sixth time in seven seasons ...advanced to the Eastern Conference Finals for the first time since 1998, where Chicago lost to the Miami Heat (1-4) ... defeated the Indiana Pacers in the first round (4-1) ... eliminated the Atlanta Hawks (4-2) in the Eastern Conference Semifinals. 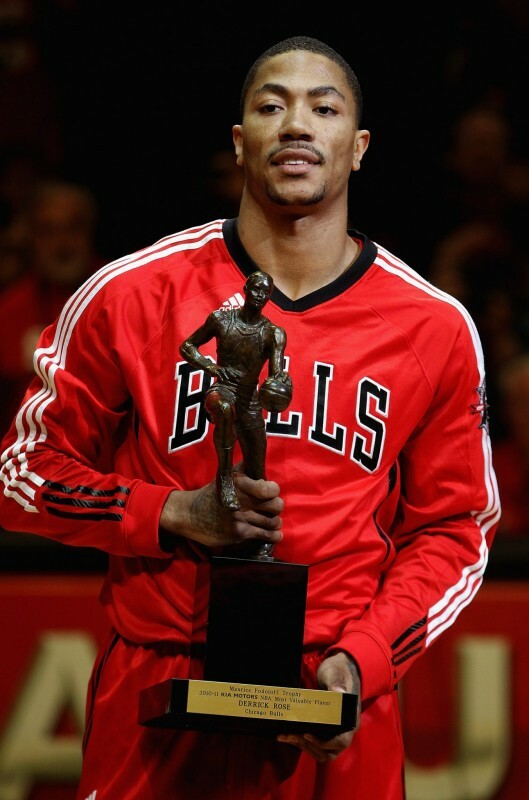 Derrick Rose became the youngest MVP in NBA history (22 years-191 days), as he became just the sec- ond Bull in team history (Michael Jordan, five times) to be named league MVP ... Rose also earned All-NBA First Team honors ... Joakim Noah was selected to the NBA’s All-Defensive Second Team ... in February, Rose was voted in by NBA fans as a starter for the NBA All-Star Game in Los Angeles; Rose recorded 11 points, five assists and three rebounds in 29:57 of All-Star Game action ...Taj Gibson was selected to play in the T-Mobile Rookie Challenge at All-Star Weekend ... Tom Thibodeau was named the NBA Coach of the Year ... General Manager Gar Forman, along with Miami’s Pat Riley, was a co-recipient for NBA Executive of the Year ... Thibodeau was named Eastern Conference Coach of the Month in January and March ... Rose claimed Eastern Conference Player of the Month honors in March.